ERBIL (Kurdistan 24) – The recent rise in Islamic State attacks in both Iraq and Syria was at the top of the agenda in discussions between the Kurdistan Region’s top security chief and the Commanding General for Special Forces in the US-led coalition on Monday. 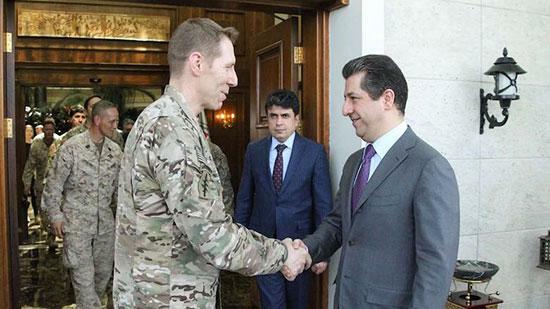 Kurdistan Region Security Council (KRSC) Chancellor Masrour Barzani met with Maj. Gen. Patrick Roberson, Special Operations Joint Task Force – Operation Inherent Resolve Commanding General, to discuss the progress in the anti-Islamic State campaign in Iraq and Syria, a KRSC statement explained. “On Iraq, both expressed concern about a recent uptick in ISIS attacks,” the statement said. Indeed, ties between the Kurdish Peshmerga and Iraqi Security Forces have much improved with the new Iraqi government, following the low to which they fell, after the previous prime minister, Haidar al-Abadi, responded to the Kurdistan Region’s historic independence referendum by attacking Kirkuk and other disputed areas. The KTCC was established in 2014, as the US entered the battle against the Islamic State, mobilizing a large coalition against the terrorist organization. Since then, the KTCC has trained over 13,000 Peshmerga. Previous articleKazakhstan’s toi: A feast or a fuss?